… she is always there for you. She studied business at the college of hotel management and learned the practice from scratch. She is, as it is said: “host with heart and soul”. Her energy is enviable. In the former times she was well known as the “Ploseschreck” on her fast skis, now she slowed down her speed a bit, because she is just too precious for us and our guests. Everyone who stayed at Summererhof knows that! … used to be a teacher of literature in Brixen. Now he has retired and contributes by giving his cultural touch to everything in the house. He loves to chat with our guests about the country and its people, politics and history, while enjoying a good glass of wine. You can see him and his constant changing aprons around the house and in the garden. He never stopped playing his clarinet in the local band. … is currently engaged in a full-time job in a medium-sized company in Brixen as an industrial engineer. But our boss is still able to win him for different works around the house and in the kitchen. Soccer is the most important secondary matter in the world for him. When it comes to playing the clarinet and the accordion or skiing, he is way better than all of us. … is our youngest member, but the greatest if we speak about music. 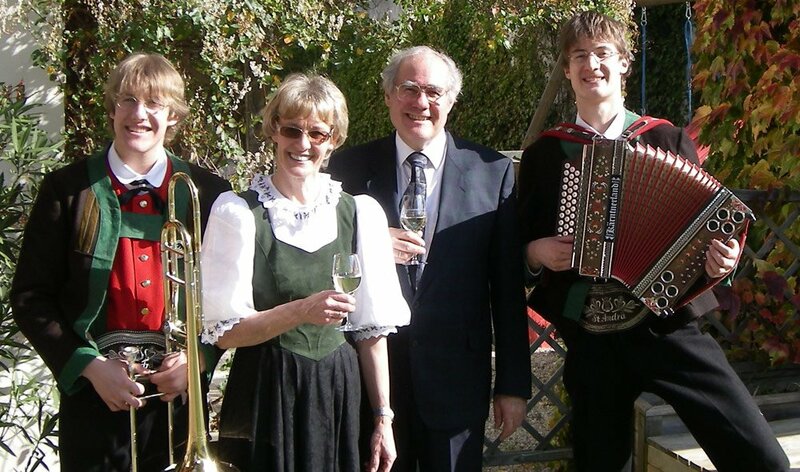 No wonder, he is close to finish his studies in the subject “trombone” at the Mozarteum University in Salzburg. Next to a teaching position in Switzerland, he is mainly on tour with his band “Bozen Brass”. Occasionally he still loves to play for our guests a small serenade, if he happens to be in town.